Take Time to Stop and Smell the . . .
Leave a Comment on Take Time to Stop and Smell the . . . The final goal was my mother’s for our yearly visit. The visit this year would follow a work event in Pittsburgh, which would put me in the area to do a little genealogy research along the way. My first stop would be in Ohio to visit a grade school friend, then on to Pittsburgh to stay for the weekend with a work colleague from years back. The work event was the following two days before the final leg heading north. The trip started with a stop at Ikea to purchase shelving. The modern styling of the store and its wares was in stark contrast to the old cemetery I would be wandering through soon. I had given myself a couple of hours to wander through the store and had to settle the urge to rush through and get on to the next task at hand. I knew I would regret my haste in the end, the next trip up being at least a year away. After paying and loading the car I started out for Mercer, Pennsylvania and the old Citizens Cemetery. I had been through this cemetery before and had taken pictures of the graves of some of my Stewart, Kilgore and McKim family line. This trip was in particular to find what I believe to be a connection to my McKim line, which ends in my research quite abruptly at, William R. McKim, my third great grandfather’s death in the Civil War. There was another McKim living in Mercer at the time, his name was Robert and his family was buried in the Mercer Cemetery. I pulled into the cemetery and took a deep breath, squelching the urge to jump out of the suv, grab my camera and run willy-nilly rushing to get done and jump back into the vehicle and get back on the road. The sun was shining and it was warming up. The stillness of the cemetery was cut quite abruptly by the whirring of weed trimmers the cemetery crew was wielding. I was finding it a bit unnerving. I climbed out of the car and dug behind the seat for the Mercer county cemetery inscriptions book I had tucked there. I grabbed my small camera after finding the all of the rechargeable batteries for the larger camera were dead, typical. I struck out looking for the new grave markers and after roaming back in forth gave up and decided to start from a known point, the markers I had photographed before. I was pleased to see that someone had tipped my fourth great grandmother, Elizabeth Yong Stewart Kilgore’s, headstone upright. Either age or vandals had pitched the headstone over onto its top hiding the inscription. It was now removed from its base and leaning back against it nestled on the ground. I started on the outside edge, recapturing the images I had on two previous occasions. It seemed over the past fie or six years some were getting even more difficult to read. I worked my way past the Kilgore’s and McKim’s getting the flags blowing in the wind of the Civil War veterans. I moved on to the Breckenridge headstones, capturing a couple that I had missed before. I moved north towards the large Stewart monument searching for Samuel Stewart, another Civil War veteran. Before the trip I had noticed he didn’t have a headstone photo on findagrave.com and wanted to complete that for the caretaker of that entry. I snapped his and his wife’s and once again tried to determine where the missing McKim headstones were. Walking eastward towards the roads I began to find my bearings. Comparing the headstones in front of me with the inscription booklet I began to roam closer and about tripped over the McKim stones at me feet. The weed trimming was still going on but I was finally managing to ignore the noise and stay at the opposite end of the men working and flying grass. Swinging my paperwork at the headstones was clearing off most of the freshly stuck on grass clippings, I nudged the large clumps off the base with the toe of my sandal. 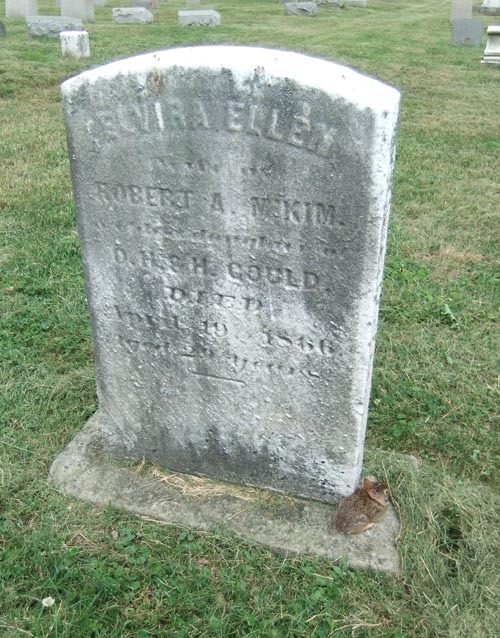 Elvira Ellen Gould was Robert McKim’s wife. When I got to Elvira’s stone I noticed a clump of dirt on the base and was about to nudge it off when I took a closer look. It wasn’t dirt, it was a tiny bunny. He was hunkered down, hoping I am sure, that I hadn’t noticed him anymore than the fellows trimming stones with their loud machines. I snapped a quick couple of pictures before I was sure he would bolt for cover. He remained there, crouched, watching me out of the corner of his eye. He practically convinced me he was tame, in my mind I suddenly became Snow White, dancing and singing to the animals. The world slowed, the noise stopped and I slowly reached down to pet him. 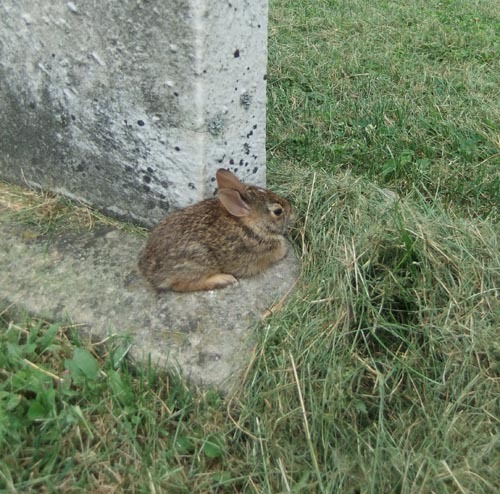 He bolted across the cemetery. The Disney moment was gone. Suddenly the sun was hot, my sandals were full of grass clippings and I wasn’t quite yet finished hunting down the relatives. Booklet in hand I moved on capturing the McKean family monument and headstones and climbed back into the car. This was going to give me plenty to update and compare. It was time to get back on the road.